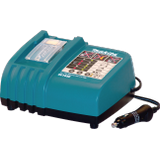 18V LXT® LITHIUM‑ION OPTIMUM AUTOMOTIVE CHARGER | Tallman Equipment Co., Inc.
Makita’s Rapid Automotive Charger is compatible with 12-volt DC sockets found in most autos and trucks, so it goes wherever the job takes you. The DC18SE will charge Makita slide-style Lithium-Ion batteries, including the 18V LXT Lithium-Ion 3.0 Ah and 18V Compact Lithium-Ion 2.0 Ah batteries. The Automotive Charger will charge an 18V LXT® Lithium-Ion 3.0 Ah battery in only 60 minutes. The DC18SE communicates with the battery’s built-in chip throughout the charging process to optimize battery life by actively controlling current, voltage and temperature.